A comfortable & portable way to keep your pets contained. Ideal for house training, traveling or post-op confinement. The Cosmic Pets Collapsible Pet Pen, an outdoor pet pen that will keep animals out of trouble, while still enabling them to spend time with the family. Pet play pens are great for on-the-go, travelling or visiting friends and family! 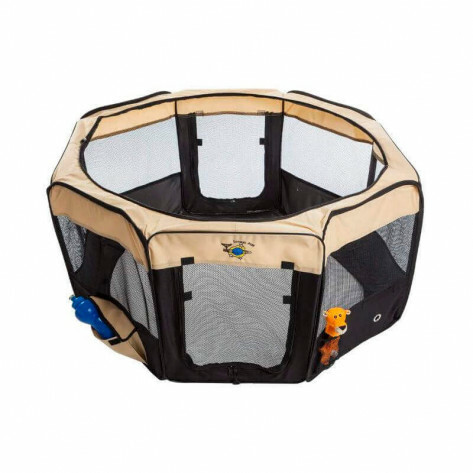 The playpen is made of durable canvas and offers a removable base and mesh cover, for good visibility of your critter. It’s equipped with two large doors for easy access and metal stakes are included to secure the play pen to the ground. Surviving the post-op: After most surgeries, pets will need to be confined for a period of time to ensure accelerated healing and complete recovery.We know that it can be hard emotionally and strategically, to confine your pet, but it is the only way they can get better. Confinement is ‘house-arrest’ or restriction to a limited area in an effort to prevent prolonged physical exertion. For travel, keep your pet safe and secure outside using the portable Cosmic Pets Collapsible Pet Pen. When using it outdoors your beloved pet can enjoy the beautiful sunny weather, sitting comfortable in one place. With the playpen's durable canvas with removable base and mesh cover, for good visibility of your small critter. It’s equipped with two large doors for easy access and metal stakes are included to secure the play pen to the ground outside. The outdoor Cosmic Pets Collapsible Pet Pen (in Medium) will keep small and young animals out of trouble, yet still spending time with the family outdoors, in new locations or on the go. For House Training, a puppy playpen, like the Cosmic Pets Collapsible Pet Pen, facilitates Potty Training! House Training does not get any easier – even the slowest of puppy will get potty trained and even the laziest owner will have great success when using a pet playpen. No need to get up and go outside 3 times in the middle of the night, when it is cold and dark. No loosing the pup in the dark, and no catching colds or worse for your little munchkin during the colder months. The Cosmic Pets Collapsible Pet Pen lends itself perfectly to both pee-pad or paper training.